When I was studying in 12th, I had hoard of intelligent classmates. About 10% of the class was very good in Mathematics. We had completed a couple of chapters of 12th Math in advance. When these chapters were discussed in Math class session we did what we could do the best. We were wicked – as any smart fellow can be – we used to solve these problems in no time before rest of the 90% could even understand the concept. Than we used to start discussing the topic between/among ourselves. Our teacher used to be disappointed, she could not tell us anything – as we had solved the problem, we were discussing the problem (how to solve it faster and not a movie). She used to feel that she is missing on her responsibility of teaching the concept to the rest of the class. We were wicked, we were intelligent, we were brutal (for our other classmates) and we were trying to make as much out of our class time that we can be more competitive. The reason was whole of our class was preparing for State Pre-Engineering Test (MPPET) – 19 or 25 of us made it to Engineering out of 70 students (which was a record for school). My friend and me were among some toppers! So, we were doing whatever we could do to get to the topics which were tough for us. One way was completing other topics faster [because we were not able to force the teacher to start topic of our choice]. Just to give you an example – Teacher was teaching Probability theory, we used to solve the problems in no time, as most of us (the 10%) were good in that. Probability otherwise was not a simple thing, so 90% were trying to grasp the concept; we are already talking in class. The 90% used to get hassled & were not able to understand whats going on! Ma’am was little too supportive to us – we were at the top! We (the 10%) wanted to finish Probability quickly and go to Vectors and 3-D Geometry. We were learning that ourselves and wanted to support our learning with class sessions. This nonsense kept on happening starting Calculus to XYZ to Probability sessions. After a while, Ma’am realized that these guys are beating the system. The “probability” of same happening in Vectors and 3-D Geometry session was increasing day by day. We were not able to understand her this very simple message or a very polite order. We felt she was being sarcastic. We started being more regular. Kept on beating the system. Even the Principal could not do much as everyone in our school knew – all these people are “actually” toppers whatever subject you take. This happened in 1996-97 during our class 12th. This is the problem of top 1% or 5% or 10%, they want to maximize their own profits, most of the times beating the system. Sometimes, we need to think – if I produce something, there should be enough money in market so that my prospective buyer can buy what I produce. At times, its about collectively growing! Disclaimer – The author could – at best – secure 2nd position and remained in top 10% most of his academic career. 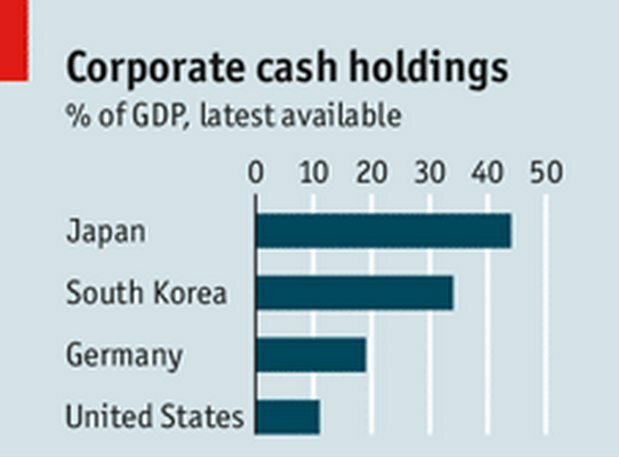 Note – Check image above Corporate Cash Holding in Japan and Japan’s economy – read recent blog – Did Keynes fail Japan? I have seen mission, vision and value statements of many companies. Occasionally, I have seen a word which seemed alien to me in that – integrity. I was wondering on the concept of Integrity and how it relates to business value system in the cut throat competitive world? I asked this question to Dr Ianna Contardo my professor of global business strategy and Associate Dean of the SP Jain Center of Management GMBA in Dubai. I had a brief nevertheless holistic discussion on the same. Her answers to few of my questions reinforced my approach on Business to the Buddha. In her opinion integrity is – unifying abstract projections of the wholeness of the identity of the being. It relates to how we behave and act in the world, align to the commonsensical approach that we are a ‘continuation of humanity’. This definition of integrity seemed very humane to me and therefore less business oriented. My apprehensions also echoed from the questions few people have earlier asked me, how social and commercial aspects can go hand in hand e.g. 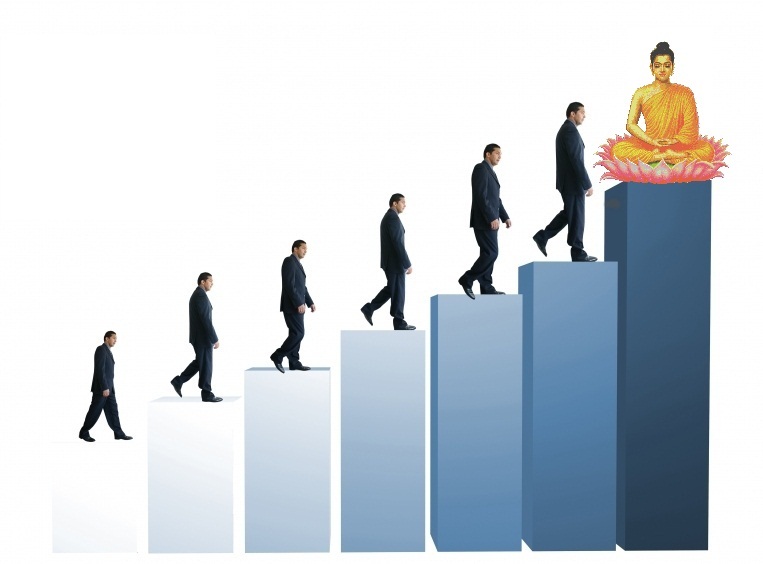 business to the Buddha. So I asked, can you please elaborate on ‘continuation of humanity’. She said – we are parts of the whole, that turns our life meaningful and transforms our existence into a multifaceted thinking, diverse interdisciplinary environments with its reach on bountiful examples of doing good through business. The statement reverberated (especially – we are parts of the whole) again to Buddha’s lessons to me. Moreover, it connected to the business very effectively. Then how to associate competition with integrity, how to respond to competition? There is no turning back on the values for a business and if integrity is one it also applies to fulfill expectations of all the stakeholders (including the competitors). Integrity plays a balancing role in creation and the future of business would be balance between business and humanity. CSR, social enterprises and NGOs are the initial first few steps towards the same. Poetically, she referred to a song and summed up – In a way, integrity represents the tipping point, the fulfillment of this prophecy whereby once you think of yourself as an accomplished ruler you will end up in the misery of solitude. On the other hand, if you walk your talk and you are that integral part of the whole, you do get to fit. Strategically, enhancing the experience of the Buddhist approach to existence is common to that of using your know-how in business. If you do engage with the rights and wrongs, learning will take place. What lesson I take out of this discussion was – integrity is not just a word in the dictionary of business it is actually getting into the business value system. As we are progressing in time the concept is becoming prominent and businesses are also evolving as humanistic institutions.